Do you know a family who are applying for a Reception place at the moment? Is your child starting school next September? We regularly receive overwhelming comments about the quality of our teachers, our learning environment and our children. Consequently, we are looking forward to welcoming parents and carers to two open sessions on Monday 27th November to share the numerous strengths of our academy. It will be an opportunity to visit the Reception classes, have a tour of the academy and speak to the staff and children. 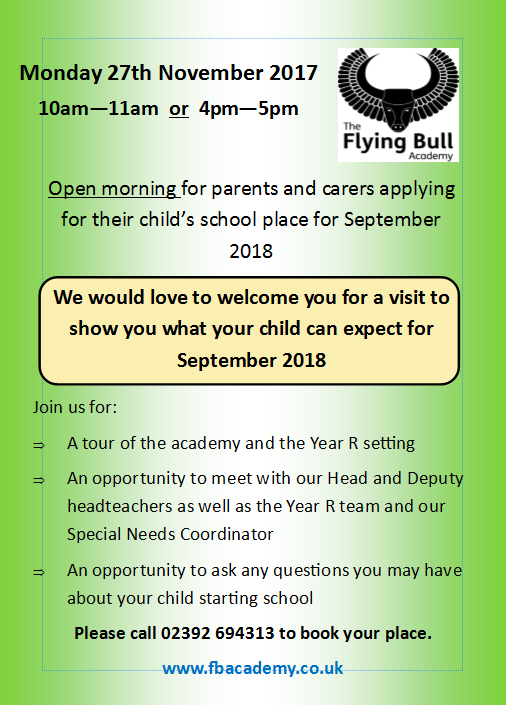 If you are applying for a school place for next September, or you know someone who is, we would warmly encourage you to attend the visit and share the dates with friends and family.